How can cities get more people using bikes for transportation, while also reducing the risk of injuries or death? It turns out that it might not really be that complicated, and that by combining bike sharing systems with protected bike lanes, cities can boost bike transportation rates and increase bicycle safety, especially for low-income and minority communities. A new report from the National Association of City Transportation Officials (NACTO), titled Equitable Bike Share Means Building Better Places for People to Ride, “looks at the relationship between building bike lanes and bike safety” through an analysis of seven US cities and some in-house research, and suggests that protected bike lanes and progressive municipal policies that encourage bicycling can have a big influence on both safety and overall ridership. In the report, which covers cycling in Chicago, Minneapolis, NYC, Philadelphia, Portland (OR), San Francisco, and Washington D.C., NACTO found that in five out of seven of the cities, as more bike lanes were built, and the number of cyclists increased, the risk of an individual cyclist “being killed or severely injured” dropped (from 2007 — 2014). And in the cities where the number of cyclists severely injured or killed went up, it did so at a slower rate than the overall increase of cycling there. The report also found that this decreased cycling risk is “especially important for low-income riders and riders of color,” because some 49% of riders who bike to work earn less than $25,000 annually, and with Black and Hispanic riders having fatality rates 30% and 23% higher (respectively) than white cyclists, building “extensive protected bike lane networks” will benefit those groups, which are at higher risk. Adding protected bike lanes “significantly” increases ridership, with city cycling rates increasing anywhere from 21% to 171% because of those additions. 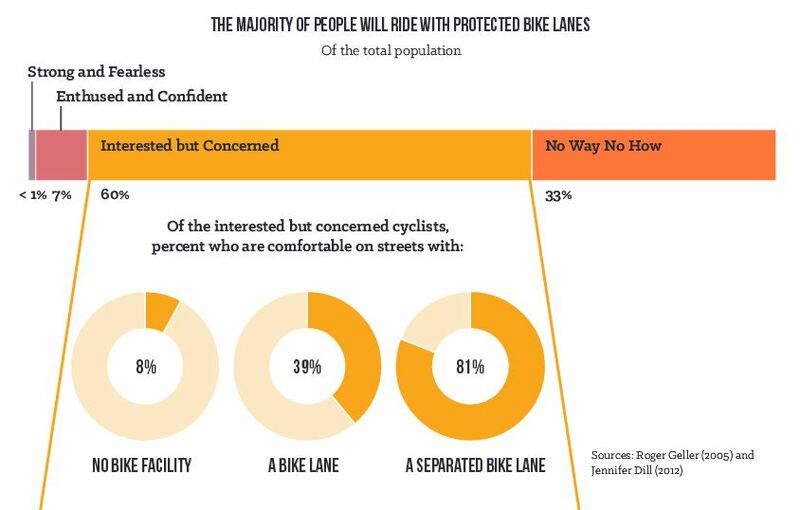 Many people (60% of those surveyed) are “interested but concerned” about cycling, and 80% would be willing to ride their bikes on city streets with protected or separated bike lanes. An increase in the visibility of cyclists can come from bike share programs, which in turn makes cycling safer for everyone, and “appropriately scaled bike share systems” can increase the overall number of cyclists in a city “dramatically” and help build the necessary momentum for building more bike lanes. Mandatory helmet laws for adults don’t increase safety, and may reduce bike ridership, including slowing the adoption of bike share systems. People riding bike sharing bikes “make up a disproportionate number of riders in protected lanes” and that for bike share systems to be more successful, there need to be more “higher-comfort facilities” (protected bike lanes) in order to help people feel comfortable with their safety and risk level while riding. Derek Markham Derek Markham lives in southwestern New Mexico and digs bicycles, simple living, organic gardening, sustainable lifestyle design, slacklining, bouldering, and permaculture. He loves good food, with fresh roasted chiles at the top of his list of favorites. Catch up with Derek on Twitter, RebelMouse, Google+, or at his natural parenting site, Natural Papa! Biking is the way to live. Just sayin'.